Two days after a turning truck driver critically injured a cyclist, the Transformation Department takes action. The guerrilla street engineers at the Transformation Department have “staged an intervention” at the intersection of First Avenue and 9th Street, putting down two orange cones to force drivers to take turns more carefully. 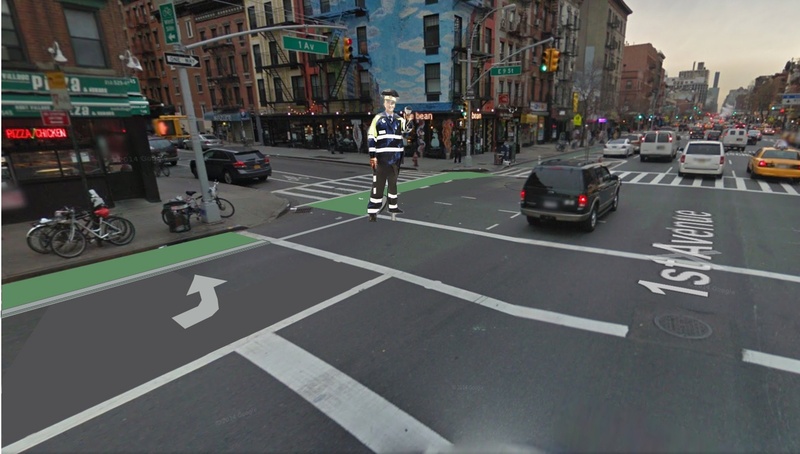 Earlier this week, a turning truck driver struck and critically injured a woman biking in the First Avenue bike lane at this location. The block of the First Avenue bike lane approaching 9th Street has a “mixing zone,” in which cyclists and drivers turning left negotiate the same space during the same signal phase. Intersections that separate cyclists and turning in time with “split-phase” signals have a safer track record than mixing zones, but DOT prefers to limit them to intersections with high pedestrian volumes. Another option is to compel the turning drivers to take the turn at a sharper angle and slower speed, which is what today’s intervention by the Transformation Department accomplishes. It’s a similar concept to the “protected intersection” design that American cities are starting to test out. Would be nice to see these corners tightened up significantly all along the protected lanes. 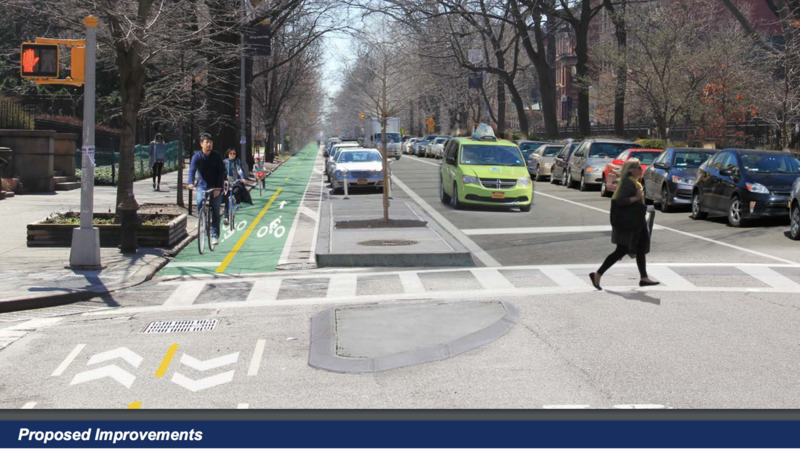 Something like this corner island that was proposed for Clinton Ave in Brooklyn. (thanks to @HildaBikes for reminding me of this design). Even better would be to continue the green paint across the intersections for visibility. The FDNY problem with tightened geometry is solved by the rollover curb. They could probably make the curb even higher than this and a fire truck could still drive over it. Please hold. Your call will be answered by the next available agent. Your call is important to us. Please stay on the line. I never understood why the green paint doesn’t continue through intersections. It’s done in other cities and it seems like the place where it would be most needed. I’m sorry, sir; there’s no category for blocking a bike lane. Would you like me to report it as illegal parking? Maybe these guys shouldn’t be so quick to call attention to their work. I’ll bet that the cops just go and remove the cones as soon as they find out about them. That’s what happened with the Transformation Department’s cones on Chrystie Street. Better to put the cones just and let them do good for a couple of days. Announce it with pictures only after the cops have removed the cones. However, the paint on the streets in the mixing zone gives different directions (see here for a good pic: http://nyc.streetsblog.org/2017/04/05/turning-truck-driver-critical-injuries-woman-biking-on-first-ave-then-nypd-tickets-cyclists/ ). The sharrows do not direct bikes to merge with traffic; rather, they hug the curb. Indicating to bikes that they SHOULD be passing to the left of turning vehicles. Why doesn’t the bike lane explicitly cross the turning lane about 3 car lengths back; the safe thing to do? Drivers would probably respond to a big green lane or crosswalk crossing the turning lane. 1. Differences in how to correctly navigate split-phase signals (stay to the left and watch the light) vs. mixing zones. 2. How to tell the difference between a split-phase signal and mixing zone, so you can take appropriate action. Because apparently, the correct way to navigate the two is very different. 3. The pros and cons of passing through a mixing zone TO THE RIGHT of turning traffic, not just merged with it; and how to get back into the bike lane on the other side. It’s also worthwhile to point out that p. 16 of the biking manual makes it clear how to bike around trucks (stay away). IN particular.. “Do not squeeze between a truck and a row of parked cars.” Unfortunately, the victim this week was trying to pass to the left of turning vehicles in a mixing zone, AND squeezing between a truck and the curb. The difference between instructions/best practice and design in #1 is further muddled by the leading bike intervals on 6th Ave which are painted like a split phase and have 5 seconds of split phase, turning to mixing for the rest of the phase. If you’re approaching on green and plan to go to the left of stopped cars and then it turns to yellow and the cars start rolling, you’re SOL. If your city’s bike infrastructure requires an instruction manual, that’s a sign that something is wrong. Narrow green painted lanes perpendicular to the motorist’s path are hard to see over the hood and through the windshield. Not painting them alerts the bicyclist that there are motorists crossing and to be careful for cross traffic. turning motorists. Don’t put down cones for the cyclists to run into. The Gothamist article linked says the driver was making a left and struck her. Doesn’t say cross or hook. The presumption is that both she and the truck were travelling up 1st Avenue, which is one-way, which would be a hook. Does this clarify what it is? I’m not familiar with this intersection. It’s best practice to make drivers aware rather than put all responsibility to avoid collision on people riding. Also, there are wider bike lanes like Kent that are still not painted across intersections and driveways. The situation will never improve until the DA and the NYPD start getting their act together and charging these drivers with serious crimes. Today I was the victim of an attempted murder when, after a minor dispute, a psychopath chased after me on my CitiBike and even accelerated the wrong way up Mercer St in order to run me down, which he did, at the corner of W4th. Full speed, right into the back of me, I flew into the air and came down hard, lost a lot of skin and my back is screwed. The cops are charging him with vehicular assault, driving the wrong way etc. Whatever happened to attempt murder? The cops have 5 witnesses who recounted that they saw the guy deliberately ram into the back of me at high speed. Of course if I had been a member of the NYPD, they would have shot him, and if he’d survived that then he would have been hit with attempted murder of an officer. No such luck for us peons. You must be new to the business of keeping cyclists and pedestrians safe on city streets. That’s okay, we all have to start somewhere. Please stick around and keep reading, it will demonstrate that your idea(s) i(are) misguided. They might just be doing it exactly right. It’s not there for perpendicular eyes, it’s there for the parallel ones – to show turning drivers where they will be interacting with cyclists. I am very aware of the improvements on Chrystie Street. However, that upgrade had already been approved when the Transformation Department placed its cones on the old configuration — cones which were removed as soon as they were announced by the group. But there is no fix planned for the mixing zones at the intersections of First Avenue. In order for cyclists to enjoy the temporary benefits of the Transformation Department’s cones at a First Avenue intersection, the cones need to be in place for more than a few hours. So the suggestion to keep mum on any new placements of cones until they’ve been discovered and removed is a sensible one. How many tens (hundreds?) of thousands of intersections there are in NYC? Don’t know but this group is not going out trying to actually provide a long-term solution one intersection at a time. They are activists demonstrating what the city should be doing on its own. It appears to be very, very successful in that. Good Lord, what an awful person. I hope this criminal is held accountable; it doesn’t sound promising. Yikes! Glad you are alive. What was the dispute? Wrong side? It’s the driver side, they should have more view on driver side. Sharper turn is an interesting idea. Barriers would have to be very large and solid or collisions would happen. As I cycled up E3rd St there was double parking on both sides so all traffic was moving slowly through this narrow corridor, including multiple vehicles and bicycles. This psycho in a yellow Dodge was yelling at them to get out of the way and he even nudged my back wheel with his fender. I yelled at him and called him an idiot (anyone would). He starts yelling threats that he’s going to “f*ck me up” and as I cycled past him when he stopped at the intersection, I saw that he had a baseball bat and was swinging it through the window. I swatted it away, and his side mirror broke in the process. Totally his doing. That rang all of his bells and so he yelled “I’m gonna kill you!” and started spinning his wheels. I went off like a rocket and turned right onto Mercer hoping that he wouldn’t come the wrong way up a one way street, but he did, accelerating like crazy. I looked over my shoulder to see him bearing down on me fast with perhaps a second until impact, and I just thought “that’s it then” and the next thing I know there’s a sickening crunch and I’m spinning through the air. Even as I’m on the ground in a daze he jumps out of his car yelling and saying he’s going to f*ck me up. 62 year old scumbag from the South Bronx. Yes the DOT “prefers” to let people get injured or die, rather than installing the best safety solution like split phases at every intersection, like they did on 9th avenue in chelsea. According to DOT , On bike lanes with split phase crashes are reduced by 50% , with mixing zones they are reduced by 20-30% . NY city cyclists, it is up to you to insist on the safer design like split phases on bike lanes! the pedestrians want them ! why not join forces? That’s not correct. The Chrystie St upgrade had not yet been approved when DOTr did our demonstration. In fact, it was specifically done twice: once to show what was possible and to support a proposal from Dave “Paco” Abraham and again in advance of a community board meeting at which DOT presented its plans. It was the second demonstration that helped turn out people to the community board meeting. And to clarify, the pictures often do a better job of building the case for better infrastructure than leaving them there for a few hours does. We prefer to do a quick fix than to leave cones around. Since they are not permanently affixed to the ground, cones can get knocked over easily and hurt more than they help in the long run. We merely want to show that the space exists and more can be done. Short installations and pictures demonstrate that just fine. OK, thanks for the correction on the timeline. And I suppose that, if the strategy is to use the pictures as the tool, then publicising it right away is the thing to do. Hopefully someone tortures and murders him in prison (if he goes to prison at all). The hate I have for pieces of turd like that trumps any desire to maintain any image of civility. 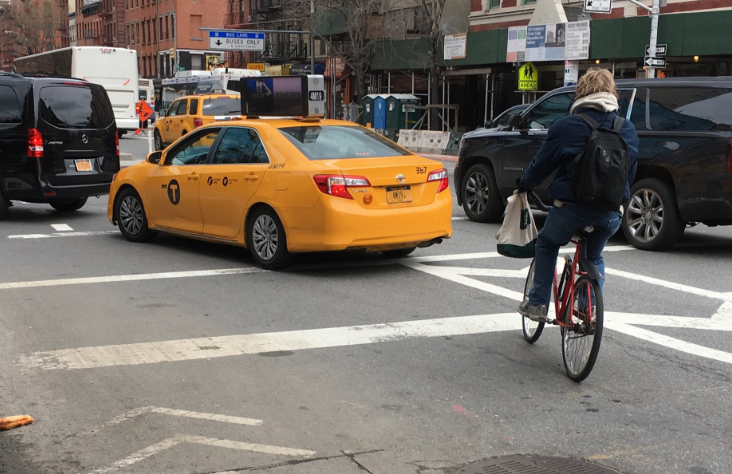 On Tuesday, the transportation committee of Manhattan Community Board 7 unanimously passed a resolution calling on DOT to replace "mixing zone" intersections on protected bike lanes along Columbus Avenue and Amsterdam Avenue with designs that maintain more physical separation between cyclists and motor traffic. A box truck driver turning left onto 9th Street critically injured a 31-year-old woman biking north on First Avenue this morning. DOT is starting to test out bikeway intersection designs that could replace the "mixing zone" treatment the agency has favored for the past several years. It's very hard to keep drivers from hitting us. DOT's preferred intersection design for protected bike lanes doesn't do enough to protect cyclists from careless drivers.